Here's my manicure that I did on Tuesday night. 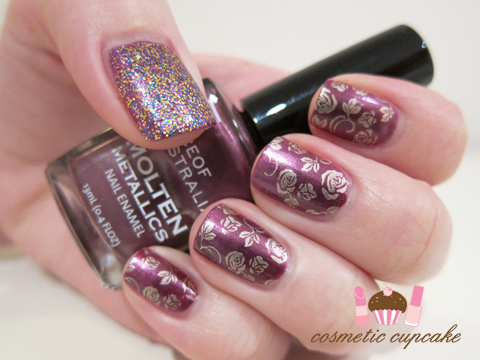 Lots of ladies on Twitter were tweeting that they were using the fabulous Face of Australia Molten Metallics collection (which I swatched for you guys here - Part 1 & Part 2) for their manis which made me want to get my polishes out too! I am really loving the full roses Konad image so I went with Amethyst and the konading in gold to complement it. I used 2 coats of Face of Australia Amethyst as a base colour on all fingers. 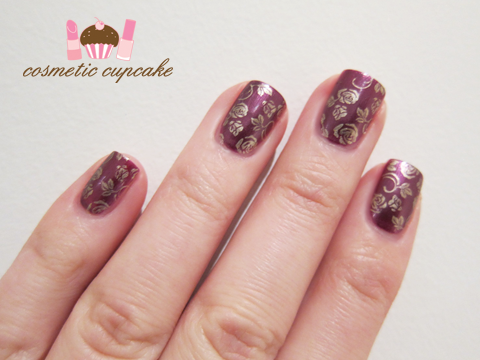 I then stamped full roses image from Konad plate m65 using China Glaze Passion on all fingers except my thumb. For my thumb I wanted a bling accent (ie. Blackberry bling!) so I applied 2 coats of OPI Sparkle-icious over Amethyst. Normal posting will resume as soon as I'm 100%! I have so many exciting posts to share including the awesome Schwarzkopf event I attended, an Illamasqua master class and swatches and products too! Thanks for looking as always =) Don't forget to enter my Glitter Gal giveaway! Lovely and understated. The 'Blackberry bling' really pops! Very nice! 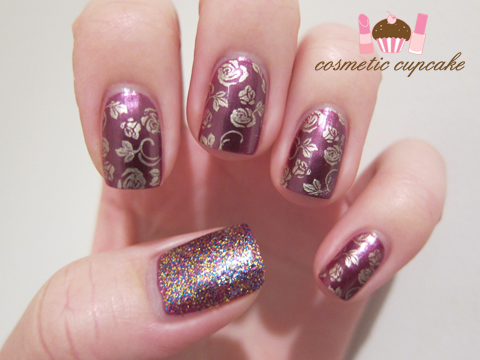 I love the stamping combination and Sparkle-icious really complements those colors. I love this look. I wish i could Konad like you! I have never quite got the hang of the stamp. Love that color combination, it's so pretty! Omg so gorgeous! When my ban is over I really have to get some Konading stuff! Ack, hope you're feeling much better soon! This is so beautiful and elegant! Love them! Wonderful mani! Swatching can also be considered as meds =] Hope you'll get well soon! Take care!!! Love the combo of both gold and blackberry on the Konad, and the sparkle thumb is a really cute accent! @Danielle: I love a glitter accent nail and the Burlesque glitters are just perfect! @KarenD: Thank you Karen! I love the combination of purple and gold and Sparkle-icious has those colours too which was just right. @Tammie: Yes definitely get some konading stuff!! It is SO much fun! @Christine: Thanks so much Christine =) It's so annoying being sick x( I'm glad you like the mani! Konad have such wonderful designs hehe. @Angela: I'm sure you'd do a great job! With konading it just takes practise. I failed so badly when I 1st started lol. @Camy: I'm so glad you like it Camy! @Kayleigh: LOL it definitely can! Nail polish can be very therapeutic. @Jo: Awwww thank you so much Jo!